Formulating a Capabilities-Driven Strategy (CDR) is easy, but the execution is difficult, especially in turbulent times. This is not the time to http://flevy.com/blog/wp-content/uploads/2019/03/Capabilities-Driven-Strategy-768x513.jpeg 768w, http://flevy.com/blog/wp-content/uploads/2019/03/Capabilities-Driven-Strategy-1024x684.jpeg 1024w" sizes="(max-width: 300px) 100vw, 300px"> find a cave and hibernate until the economic storm passes. It is unlikely that the storm will pass anytime soon. 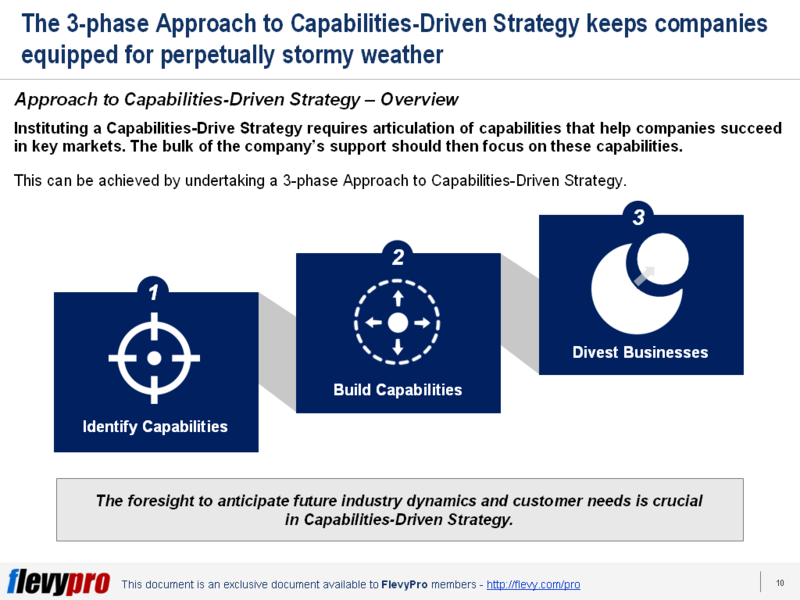 Capabilities-Driven Strategy is the only way to remain equipped for perpetually stormy weather. Companies need to take care or build those capabilities that are genuinely needed and not those that do not serve our customers. Capabilities do not manifest themselves overnight. They take time to grow. But companies who have mastered the art of developing and implementing a Capabilities-Driven Strategy have grown to develop the world’s leading brands. Distinctive capabilities–i.e. Core Competencies–have been used to propel them to reach operational and business excellence. What is a Capabilities-Driven Strategy? A capabilities-driven approach to strategy allows companies to become coherent. This leads companies to achieve scale by applying their distinctive capabilities throughout the entire company. Instituting a Capabilities-Driven Strategy requires articulation of capabilities that help companies succeed in the key market. The bulk of the company’s support should then focus on these capabilities. This can be achieved by taking on a 3-phase Approach to Capabilities-Driven Strategy. Phase 1 starts by identifying the drivers of demand in your market. It is essential to identify capabilities that could meet expectations and satisfy our customers. Building capabilities are the next critical phase underlying the Capabilities-Driven Strategy. Phase 2 looks into the building up of complementary, reinforcing capabilities vital in our capacity to execute and deliver. Divesting business is the 3rd phase of Capabilities-Driven Strategy that requires a thorough analysis of our capabilities and actions. We can either streamline or sell our businesses. What we have – our capabilities play a vital role in this decision that we have to make. Whatever decision our company takes, what is essential is to have the foresight to anticipate future industry dynamics and customer needs. Starbucks is the world’s most iconic brand and known for ambiance in its retail stores. Strategically, Starbucks used its distinctive capabilities to be the purveyor of the “third place” for conviviality. To achieve this means being the center for human activity after home and work. Starbucks has to identify its distinctive capabilities before being able to use it strategically. Starbucks has stewardship over a globally available consumer experience. It can distinctively deliver its products and service, as well as design and develop a premium product line. Starbucks is known for recruiting and managing a cadre of dedicated employees. Summing it all up allows Starbucks to develop the Capabilities-Driven Strategy that will establish itself as the purveyor of the “third place” for conviviality. 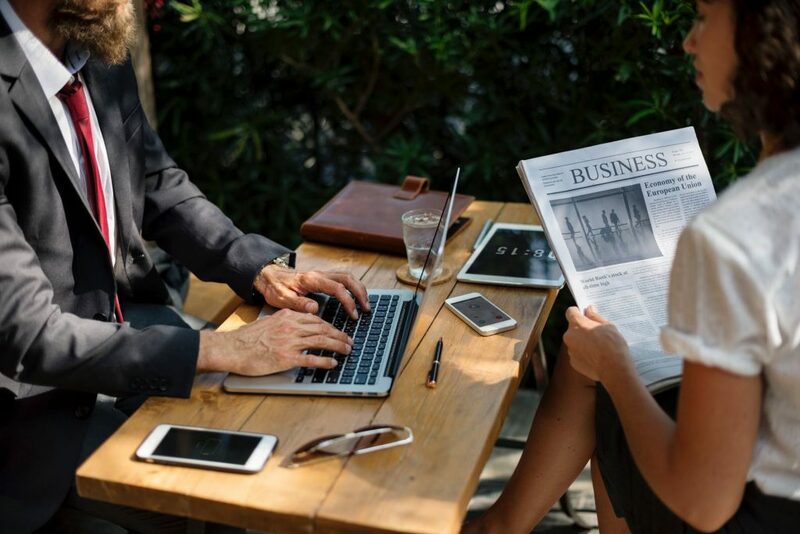 Distinctive capabilities are effective tools that companies can use to connect where they aim to go and what they can accomplish. Starbucks was able to effectively use these tools to lead them to where they want to go and be. The journey can be a challenge for each and every company. We can all be like Starbucks. We just need to have a good grasp of what we have and what we are capable of doing. This can make a big difference between becoming what we aim for and just being content with where we are now in the midst of uncertainty. Interested in gaining more understanding of Capabilities-Driven Strategy (CDR)? You can learn more and download an editable PowerPoint about Capabilities-Driven Strategy (CDR) here on the Flevy documents marketplace.